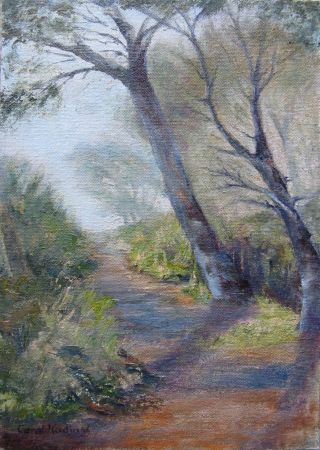 This was another view of the pathways on Signal Hill where I have participated in so many painting sessions. and still I battle to photograph paintings! The gloss of this one has interferred with the colour somewhat. I have just discvovered an incredable website called Wet Canvas and have had the most amazingly mind bending morning learning from the wise words of other artists. If any of you get the chance, go and have a look at this very extensive website. Hi Carol, Signal Hill has provided you with so many subjects! You have a real series going. I love the subtle colours you have used. Your aerial perspective works very well. I think I am almost getting to the end of Signal Hill, for the moment. I still want to do the twelve appostles though, although Doreen says the view from the Round House is better. You need a long canvas! Thanks you for your kind words Di. This is one I haven't seen! They just get better and better - lovely depth and distance. Oh Liz, you are so sweet. Thank you, my painting is not going so well at the moment and I needed that. Trouble is I spend too much time on the computer instead of drawing and painting. I'll have a look one day though. Many thanks for the link. Oh Carolann I totally agree! We have just got ADSL and I am wasting so much time on the internet. Di actually made a comment about it. One has to be very disciplined and I am hoping that I will be able to do that soon!